EPIZYM - AW - Agriculture Products - Animal Liquifiers and Deoderizers by Epicore BioNetworks Inc.
PHYTOZYM 2-2-2 Liquid Foliar Spray and Seed Treatment is a stabilized biochemical concentrate that enhances the penetration of nutrients and other growth stimulating factors through the barrier layer of foliar, stem and seed parts of plants. 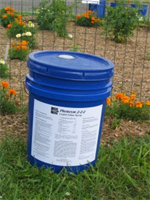 EPITHATCH Biological Thatch Digester is a dry biological formulation that biologically decomposes dead grass rapidly and efficiently without harming living grass. EPITHERM Microbial Ecosystem for composting organic waste, is a dry formulation, dispersible in liquids, and creates a unique microbial ecosystem designed to accelerate composting processes. No reviews were found for EPIZYM - Model AW - Animal Liquifiers and Deoderizers. Be the first to review!